Fred A. Kaletka, 90, Lugerville, died in the Park Manor Nursing Home in Park Falls on Thursday, March 14, 2019. He was born in Lugerville, Wisconsin, on August 22, 1928, the son of Martin and Frances (Klamra) Kaletka. He was a 1947 graduate of the Phillips High School. He was married to Betty Kauffman in the Immanuel Lutheran Church in Marshfield on June 8, 1968. He was employed by DHIA, Dairy Heard Improvement Association, as a Field Man, and then for many years was employed in the Maintenance Department of the Marshfield Clinic until the time of his retirement in 1990. Following his retirement Betty and Fred made their home in Lugerville. 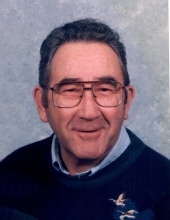 He was a member of the Trinity Lutheran Church of Phillips. In his free time he enjoyed hunting, fishing, and especially walking in his woods. He is survived by his wife, Betty; by five children, James (Linda), Marana, AZ, Tom (Therese), Belle Plaine, MN, Donald (Sheila), Menominee, MI, Larry (Sue), Mt. Horeb, WI, and Kim, Butternut; by 9 grandchildren and 5 great grandchildren; by one brother, Patrick Kaletka, Huachuca City, AZ; and by one sister, Lee Wiggins, Ocala, FL. He is preceded in death by one granddaughter, Angela; and by six siblings, Frank, Lester, Bill, Matthew, Esther, and Ann. Memorial services will be held at 2:30 P.M. on Saturday, March 23, at the Trinity Lutheran Church in Phillips with Pastor John Trewyn officiating. Inurnment will be in the Lakeside Cemetery in Phillips. Friends may call at the church on Saturday, March 23, from 1:30 P.M. until the time of services. To plant a tree in memory of Fred A. Kaletka, please visit our Tribute Store. "Email Address" would like to share the life celebration of Fred A. Kaletka. Click on the "link" to go to share a favorite memory or leave a condolence message for the family.